Welcome to the year 2 page! We have an exciting term planned ahead! Please scroll down to find the curriculum letter to parents for the Spring Term which outlines curriculum coverage, routines and procedures for this term. We have a small number of cardigans and jumpers which have been left in the box in the classroom along with a few hats and gloves. Unfortunately these do not have names in. If you think any of these items may belong to your child please speak to one of the staff. As the weather warms up, the majority of our PE lessons will take place outdoors. Please make sure that children have suitable outdoor trainers in their kit. Children will also need a long sleeved top and trousers for cooler days. 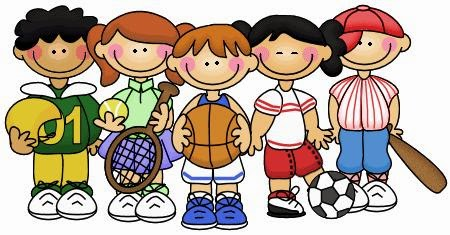 PE lessons are on Tuesday each week. Please ensure that kits are in school on this day and that all items of clothing are named. We will begin the term by consolidating our calculating skills, specifically addition and subtraction. We will also be covering multiplication and division and money. During the second part of the time we will begin to look at telling the time and exploring shape. We will continue to develop arithmetic skills (addition, subtraction, multiplication and division) and reasoning and problem solving skills. Please keep up the hard work with IXL and TT rockstars at home - these are having a positive impact! The children have been busy and have already written recounts and character descriptions during the first half term. We will spend the first two weeks after the half term holiday writing our own version of the Three Little Pigs. World Book day activities will be linked to this theme and children will create resources, games and activities linked to the story. Spelling, grammar and punctuation skills will continue to be developed and consolidated throughout the term. Please remember to look at Studyzone for help with grammar and punctuation skills. This website can be very helpful especially when completing your homework! Passwords were sent home during the Autumn term. The children have been working hard to improve their handwriting and four more children have been awarded their handwriting pens so far this term - fantastic!!!! Many more are very close - keep up the hard work! Children will continue to take part in weekly guided reading and comprehension sessions this term with a specific focus on developing comprehension skills. Pupils will continue to take their reading book home every night and will be encouraged to reach the target of reading four times each week. Please ensure that your child has their reading record book in school each day. Homework will be set every week. There will be a maths focus and an English focus. We will spend the first session on Friday morning going through the homework together and marking it. New homework will also be issued during this session for the following week. Please ensure that homework books are in school every Friday. The following learning strategies are useful in helping your children to learn spellings at home – Year 2 words common exception words, as well as personal inaccurate spelling need to be addressed. 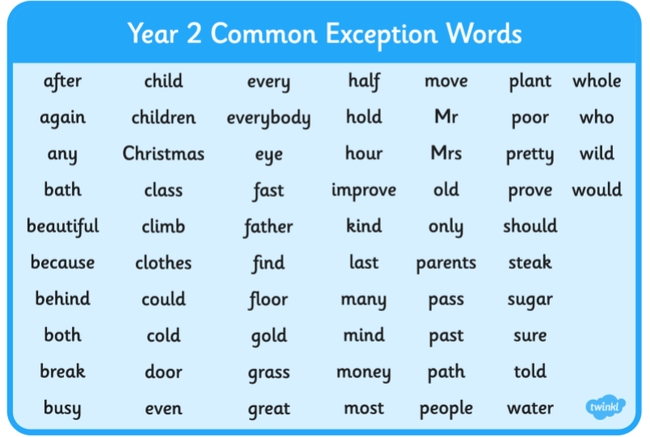 Please find the year 2 common exception words further down, which need to be learnt by the end of the year. PE takes place every Tuesday afternoon. Where possible this will take place outdoors. As the weather is getting colder, please ensure that you have a full outdoor PE kit and sensible trainers in school every week. You may also wish to have a plastic bag in your PE bag to put wet shoes into.